But there was one saving grace. In the Adoration Chapel, face to face with Jesus’ True Presence, I was able to confront the truth of myself. I was stuck in my sin, and confused by my many disagreements. And with Truth itself before me, I had no darkness in which to hide. I asked Him to remove my sin from me, but somehow I knew He was far too gentle to barge into my life and take it away. On my doubts about Church teachings, He was also silent. I didn’t realise that in all this I was resolutely trying to keep Him a distance away. I wanted a convenient God to turn to in difficulties, but not one that could have a real claim over my life. He would not bridge the distance – no matter how much it was killing me on the inside – if I did not allow Him too. A retreat organized by the Archdiocese in Singapore and led by the Archbishop was my first turning point. There, I learned the true grace of Confession. In it, I was like the woman in the Gospel story – standing with all my sin on display. But just like her, that was not the end of the story. The grace of reconciliation and healing could then take root, and begin its work. 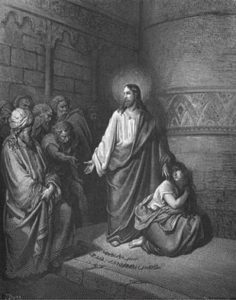 While I still fell, and still fall in many ways, there is always this open door to come back to Him, to hear again: go in peace, sin no more. The second turning point was someone challenged me to show that my faith was true. It had only been two months since the retreat, and I was still stumbling all over the place! At that point, I was wandering amongst several denominations during this time, seeking out the parts of them where God’s spirit was very much alive and well, but somehow still going for Mass on Sundays. However, it took someone bold to point out the elephant in the room – I could not just wander, while claiming to be part of the one true Church. She asked me to defend my faith, or leave it behind. This shook me to my core, because I had begun to believe the Church’s truth, but hadn’t looked into the reasons yet. She had arguments that seemed plausible but, if true, would completely strike off all my experience of God thus far. By another miracle of grace, I stumbled upon a time of Adoration almost immediately after. Sitting in front of the Blessed Sacrament, I asked Him to help me learn the reasons behind my belief in Him, and His Body, the Church. After that, I began to look into my faith more intentionally, helped along by the guidance of Alex, one of the University Chaplains. She answered my questions candidly, gave me books to read, and guided me to see how God was working in my life and how I could cooperate with that work. She and many others I met at the Chaplaincy were always happy to share the myriad reasons for the hope that they had, and all this inspired me to keep digging deeper into these inexhaustible Mysteries. But all this knowledge only means something because it relates to someone, the Person of Jesus Christ: who He is and the ways in which He loves us. A friend of mine put it beautifully: in Confession, we give our whole self to God, and in the Eucharist, He gives His whole self to us. He has given us these beautiful Sacraments, these ways through which the ordinary is made divine, and the fruits of Christ’s life, death, and resurrection are continually shared with us. And through these gifts, He forgives us, strengthens us with His love, and then sends us off again, to bring the message of His love to other people.